Saint Olaf's Day is celebrated in some Northern European countries on July 29. It commemorates the anniversary of the death of King Olaf Haraldsson of Norway. This holiday is an official flag flying day in Norway. Olaf II Haraldsson reigned over Norway from 1015 to 1028. He was driven into exile when Norway was invaded by King Canute the Great of Denmark. Later he returned with his army to regain his throne, but was killed in the Battle of Stiklestad on July 29, 1030. King Olaf was canonized in 1031 because his martyrdom in the Battle of Stiklestad is believed to have contributed significantly to the establishment of Christianity in Norway. Saint Olaf is remembered as Norway's Eternal King. The Norwegians call Saint Olaf's Day Olsok, which means “Olaf's vigil” or “Olaf's wake”. Olsok used to be a major church holiday before the Lutheran Reformation. In the late 19th and the early 20th century the holiday started to become popular again. 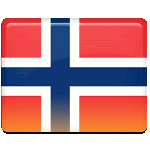 It has been an official flag day in Norway since 1930. The holiday is still recognized in the Faroe Islands that used to be part of Norway. King Olaf is also remembered in Denmark, Sweden and Finland, although Saint Olaf's Day is not an official holiday there.